On November 21st, Monday, the Pittsburgh Penguins made two managerial decisions. They placed Chris Kunitz on the injured reserve, and recalled Jake Guentzel from the Wilkes-Barre/Scranton Penguins. This can mean one of two things regarding Kunitz and Guentzel. Either Chris Kunitz is "injured" and the Penguins want to get a look at Guentzel, or Kunitz is legitimately injured and the Penguins recalled Guentzel because of it. Obviously, for the sake of Kunitz's health, you hope it's the former. But either way, it's going to be great to see the Penguins' best prospect (perhaps tied with Daniel Sprong) get some NHL ice time. During his stint with the Wilkes-Barre/Scranton Penguins, whom he leads in points with 17, he mainly played left wing on the "Greek Line" alongside Carter Rowney and captain Tom Kostopolous. During line rushes, Guentzel was with Evgeni Malkin and Phil Kessel. Quite the start. Hornqvist skated on his own before. 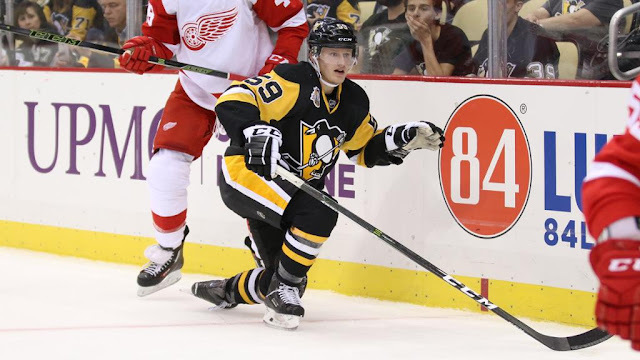 The Pittsburgh Penguins play the New York Rangers tonight at PPG Paints Arena, at 7PM EST.